Reunion tours are all the rage these days, and Rhapsody and the Romantics couldn't resist mingling with their fans once more. Even though their string of hits ended after one, they are confident that they are on their way back up to the top. Tonight they plan on introducing a brand new song. Will this new tune light up the night or turn out to be a swan song for a member of the group? You will remember the members of Rhapsody and the Romantics from back in 1988, when their hit, If Love's the Answer, What's the Question?, topped the pop charts for several months. Lead singer Rhapsody is back with her usual flair for the dramatic. Melody Mezzo has returned to add the rich tones that made her a sensation in Europe until she severely strained her voice and was forced to give up her real love, opera. Sweetly blending with the others, Harmony brings with her a very colorful and varied past which should add new excitement to the group. The folks you may not remember are: Manny Jerrell, the manager of the group both then and now; Justin Case, entertainment lawyer and new main squeeze of the group's leader; and Cash Paycheck, long lost and almost forgotten husband of Rhapsody. 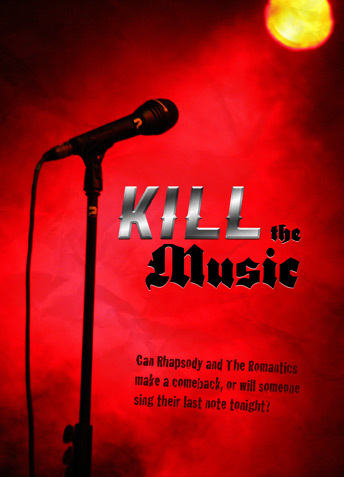 So sit back and prepare to be thoroughly entertained by Rhapsody and the Romantics! We all know what to expect when we come to a concert...talented people perform...we enjoy...we applaud...but what happens behind the scenes of a traveling musical show? Is it all fun and games, or is there a dangerous element involved? Is it possible that someone will sing their last note tonight? Will one of the guys be bumped from the road trip? It will be up to you and your table of fellow sleuths to discover who the perpetrator...or perpetrators might be. So think of a clever name for your table, er, detective agency and listen carefully for clues. At the designated time, your agency will be asked to formulate a question that your delegated chief detective will ask a suspect. Once all tables have completed their questioning, each detective agency will submit a solution sheet indicating "who done it" and why. The first agency to name the correct culprit and most correct motive wins. No last name, just Rhapsody, kinda like Cher and Madonna. She is the lead singer of Rhapsody and the Romantics and she would lead you to believe that she will be the next mega-star in the music industry. She has been married to Cash Paycheck for years, but they have led separate lives for a long time. Justin Case is now her leading man. Will she reconcile with Cash? Will she skyrocket to stardom or will she crash and burn? A member of the Romantics, Harmony has blended into many different areas in her varied career. She has been a model, an actress in some really bad movies, and has delivered singing bouquets. Not the brightest star in the sky, Harmony got involved in a string of unfortunate relationships. Will she cause enough discord to result in her finale? Will she become a “model” prisoner? Will she join a motorcycle gang (again)? The third member of Rhapsody and the Romantics, she considers herself to be the one with talent. She studied music with the goal of becoming a world renowned opera singer. She sang in many of the great opera houses until she blew her voice out. That occurrence sent her over the edge and she spent some time in a mental institution. It seems that Melody also spent time with a band of gypsies while in Europe and has adopted their mode of dress and many of their habits. She would now like to form a duet with Cash. Will Cash make her heart sing, or will that relationship fall flat? Will she be the sensational star or the dead diva? Or, will her voice shatter more than glass? Entertainment lawyer who handles copyright issues and other areas of “the business”, he is particularly interested in the Romantics because he is in love with Rhapsody and he sees in them a chance to jump into the big time with many influential clients. He was an ambulance chaser before he got into entertainment law. Always one to chase after flashing lights, his motto is “If you’ve got the money, you’ve got a lawyer.” He and Rhapsody have been dating for a year and would like to visit the justice of the peace soon. Will theirs be a peaceful union, or will a war break out? Managed Rhapsody and the Romantics the first time around and is hoping to latch onto their rising star a second time. He ran sound for “Up With America Singers” years ago and signed on as the girls’ manager from the very beginning. In the interim, since the act closed, he has run a chain of electronics stores known as MJ’s Electronics Warehouse. If his face looks familiar, it’s because he made awful local commercials for his company in which he was constantly on the phone “looking for the best deals in town.” You’ll note that the phone has not left his hand since then. He is married to Kerrell Jerrell, a former game show host. Can Manny manage to stay connected? Will his signal be interrupted? Will he enter a “dead zone”? Country music singer wannabe. He has been married to Rhapsody for a long time, but they haven’t lived together for years. She went on the road as a singer and he stayed behind to work on the family farm in Clanton, Alabama. He is trying to reestablish his relationship with her but she wants out. He is also trying to convince her to let him be their warm-up act. He sees Justin Case as a roadblock to his success. Will he plow through the barriers or go down an embankment? Hired to protect the girls from any obsessed fans and keep an eye on the equipment, he will be called upon to take on another role later in the night. He is a small time PI who is itching to be where the action is. Will he uncover a rash of criminal activities or will someone scratch his name off the dance card?